Democratic gubernatorial candidate Rich Cordray and Republican candidate Mike DeWine visited the Davis-Besse Nuclear Power Station last week. FirstEnergy Solutions announced in March that the nuclear plant will close in May 2020. 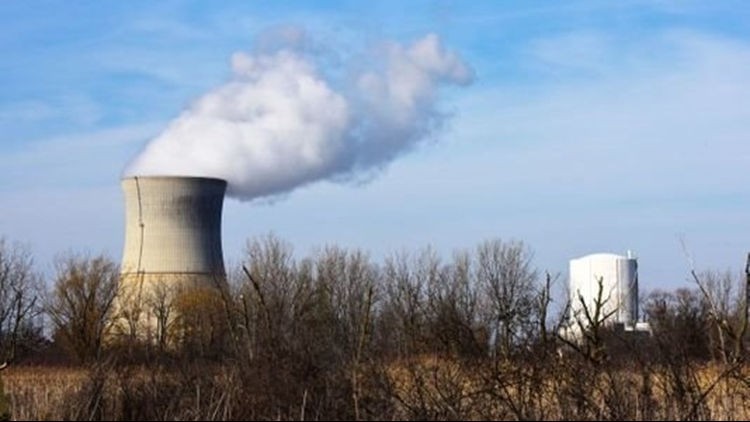 TOLEDO, Ohio (AP) — A group backed by the owner of Ohio's two nuclear plants is taking another run at persuading state lawmakers to come up with a lifeline for the plants, which are slated to close by 2021. The newly formed coalition, the Ohio Clean Energy Jobs Alliance, says that time is running out and that a solution needs to be found within nine months. Closing the two plants, which produce 14 percent of the state's electricity, would make Ohio too dependent on natural gas and take away a reliable source of energy, putting the state at risk of blackouts if the supply is interrupted, backers say. It also would mean the loss of at least 1,500 jobs and millions in tax money for schools and local governments, they say. "The list goes on and on," said Jamie Beier Grant, head of an economic development agency in Ottawa County where the Davis-Besse nuclear plant has been producing power since the 1970s. But opponents argue that a financial rescue for the plants could increase electricity rates across the state. So far, state lawmakers have turned back proposals to subsidize the Davis-Besse and Perry plants, which sit along Lake Erie. Many of the nation's aging nuclear reactors are becoming endangered because they are expensive to operate and maintain and are struggling to compete with cheaper natural gas plants and renewable energy. New York, New Jersey and Illinois have responded by giving out billion-dollar bailouts that will be paid by ratepayers to stop unprofitable nuclear plants from closing prematurely. Federal appeals courts have upheld the subsidies in New York and Illinois. Members of the Ohio Clean Energy Jobs Alliance think Ohio should look at those states to figure out how to save the state's nuclear industry. "They have shown the way forward," said Guy Parmigian, superintendent of a school district that stands to lose millions of dollars if the Davis-Besse plant closes. Jerry Cirino, a commissioner in Lake County, home to the Perry nuclear plant, said a plan needs to be in place by May or June because that's when FirstEnergy Solutions must decide whether to commit to close or refuel the Davis-Besse plant. Once that happens, he said, "there's no turning back." Cirino said he's still optimistic something will be worked out because other states "discovered the political will to get it done once it got grim there." "I don't think it's asking the world for people to understand that what's good for the northern region is good for the state," he said. "If these two plants close, there would be a ripple effect across the state."